Soar to New Heights with Campbell Biology: Concepts & Connections! Campbell Biology: Concepts & Connections continues to introduce pedagogical innovations, which motivate students not only to learn, but also engage with biology. The Eighth Edition of this market-leading book builds on its hallmarks of accuracy, currency, and a dedication to revolutionizing teaching and learning solutions. This thorough revision focuses on providing instructors with the resources needed to invigorate the course and gives students the tools they need to succeed. This edition includes many new key figures to help students better visualize tough topics, while an increased emphasis on scientific thinking equips students to leave the course thinking like scientists. 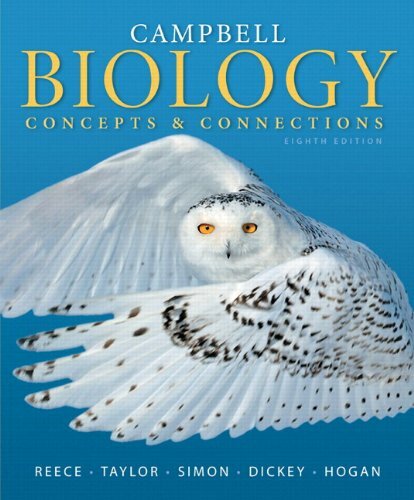 The book and MasteringBiology® work together to create a classroom experience that enables students to succeed in biology. This program presents a teaching and learning experience–for you . Focus on scientific thinking: Think like scientists and develop scientific reasoning and literacy skills with new Scientific Thinking Modules and more. Maximize learning and success: Get the tools you need to become skilled at learning and understanding course material. MasteringBiology coaches you through tough topics and helps you to actively practice concepts they need to grasp. Note: You are purchasing a standalone product; MasteringBiology does not come packaged with this content. If you would like to purchase both the physical text and MasteringBiology search for ISBN-10: 0321885171/ISBN-13: 9780321885173. That package includes ISBN-10: 0321885325/ISBN-13: 9780321885326 and ISBN-10: 0321928059ISBN-13: 9780321928054. MasteringBiology is not a self-paced technology and should only be purchased when required by an instructor.